A whole golden, succulent roast turkey: the classic Christmas centrepiece. Our birds are the much-celebrated Bronze breed. Slow-grown, organic and free range, they have juicy meat that’s full of flavour – and we include the giblets so you can top it off with the absolute best proper gravy. Feeds 10-11 generously, with plenty of leftovers (300g of cooked meat per serving). Minimum weight 5.8kg. Find everything else you need for an organic Christmas feast in our online shop. For full cooking instructions, read our ultimate guide on how to cook a turkey. Preheat the oven to 190°C/Gas 5. Remove the giblets. Transfer to a large roasting tin, breast-side up, and brush the breast and legs with melted butter before seasoning. Cover the whole bird with foil to protect the skin from over browning and transfer to the oven for 45 mins/kg. Every hour, baste with its juices. 30 mins before the end of the cooking time, remove the foil to allow the skin to brown up. Check if the meat is thoroughly cooked by inserting a carving fork into the thickest area of both breast and thighs. If the juices are pink, return to the oven for another 15 mins, then test again. Rest for 30 mins before serving. Keep in the fridge, below 5°C, and use by the date on the label, or freeze on day of delivery. Defrost thoroughly before cooking. Do not refreeze once thawed. Minimum use by date 26th December. 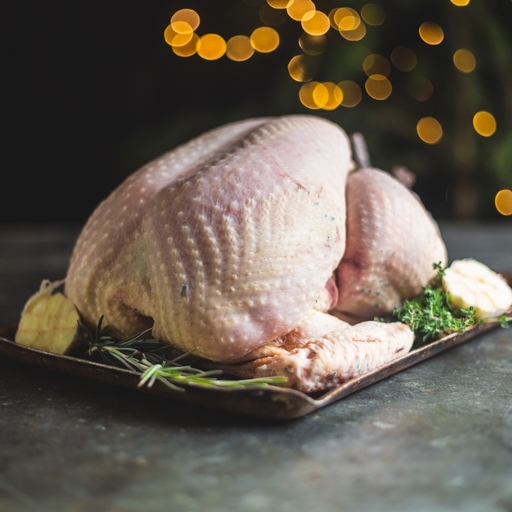 For our Christmas turkeys and turkey joints, we allow 300g of cooked meat per serving. This allows a generous 200g each for Christmas dinner, plus plenty of leftovers for sandwiches, curry or whatever takes your fancy. Our year round whole chicken serving sizes allow 200g cooked meat per person, which makes a generous meal but doesn’t allow for leftovers in the same way. Our free range organic turkeys reach maturity at their own pace while they graze organic pasture on small Westcountry farms. We choose Bronze birds: a slow-growing traditional breed that gives rich, juicy meat with an intense natural flavour. Having spent the first five to six weeks snug in a barn under heat lamps, they go out to grass and spend their days wandering around the pasture and popping in and out of their sheds as they choose. At night, they are bedded down with fresh straw and tucked up in the sheds for protection.